Mercury: Mineral information, data and localities. 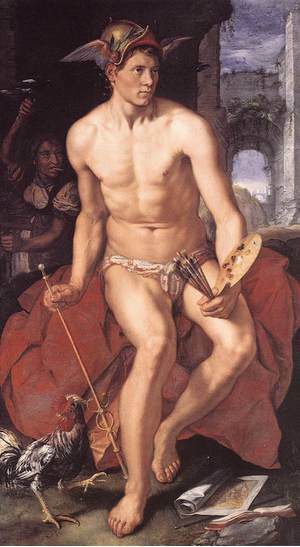 After the Roman messenger of the gods, Mercurius. 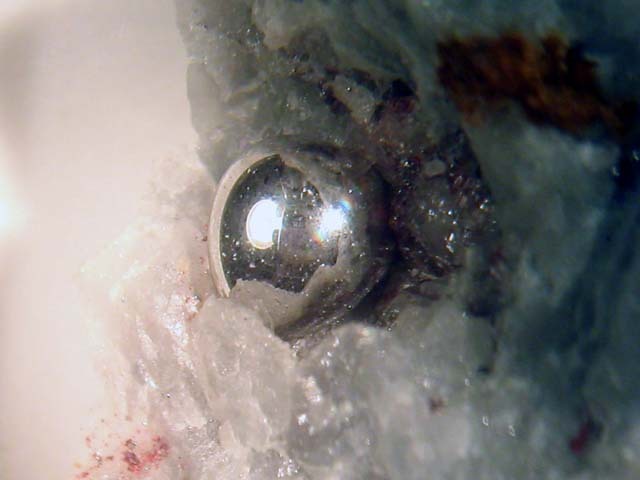 Mercury is officially classed as a mineral species for historical reasons, and also because it is distinctive in its chemical and physical properties. However, because it occurs as a liquid, it does not satisfy the normal criteria to be a valid mineral. It crystallizes at -40 degrees celsius, at which point is forms rhombohedral crystals. It is usually found as small isolated drops associated with cinnabar, but it can also be found as large liquid masses in rock cavities. Mercury is often found, along with cinnabar and other Hg minerals, as a precipitate from hot springs and in volcanic regions. 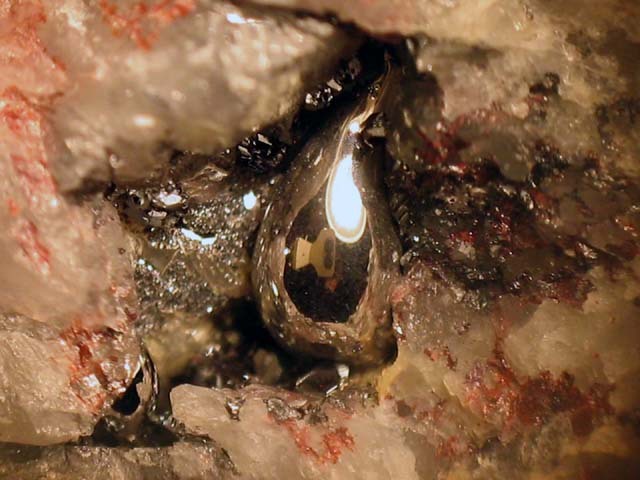 Because of its rarity, it is not often used as an ore of mercury. Cinnabar 121 photos of Mercury associated with Cinnabar on mindat.org. Quartz 20 photos of Mercury associated with Quartz on mindat.org. Pyrite 11 photos of Mercury associated with Pyrite on mindat.org. Montroydite 9 photos of Mercury associated with Montroydite on mindat.org. Calomel 9 photos of Mercury associated with Calomel on mindat.org. Edgarbaileyite 6 photos of Mercury associated with Edgarbaileyite on mindat.org. Calcite 5 photos of Mercury associated with Calcite on mindat.org. Dolomite 4 photos of Mercury associated with Dolomite on mindat.org. Wattersite 4 photos of Mercury associated with Wattersite on mindat.org. Siderite 3 photos of Mercury associated with Siderite on mindat.org. Mercury should be coated with a plastic material or placed in a sealed container since the mercury will vaporize over time. Contains mercury - always wash hands after handling. Avoid inhaling dust of associated rock or matrix when handling or breaking. Never lick or ingest. Vaporizes with toxic vapours, do not inhale vapours and store under cover. Stenbeck, S. (1933) Röntgenanalyse der Legierungen von Quecksilber mit Silber, Gold und Zinn. Zeitschrift für anorganische und allgemeine Chemie: 214: 16-26. Palache, C., Berman, H., Frondel, C. (1944) The System of Mineralogy of James Dwight Dana and Edward Salisbury Dana Yale University 1837-1892, Volume I: Elements, Sulfides, Sulfosalts, Oxides. John Wiley and Sons, Inc., New York. 7th edition, revised and enlarged, 834pp. : 103. Barrett, C.S. (1957) The structure of mercury at low temperatures. Acta Crystallographica: 10: 58-60. Anthony, J.W., Bideaux, R.A., Bladh, K.W., Nichols, M.C. (1990) Handbook of Mineralogy, Volume I. Elements, Sulfides, Sulfosalts. Mineral Data Publishing, Tucson, AZ, 588pp. : 323. The following Mercury specimens are currently listed for sale on minfind.com. McQueen, K. (2011). Mercury Mining: a quick history of quicksilver in Australia. Journal of Australasian Mining History, 9, 74.
http://search.records.nsw.gov.au/items/79266;jsessionid=ABE3D17627511F32D4A9301DB637113E. Gilligan, L.B., Brownlow, J.W., Cameron, R.G., Henley, H.F. (1992) Metallogenic Study and Mineral Deposit Data Sheets: Dorrigo-Coffs Harbour 1:250 000 Metallogenic Map SH/56-10, SH/56-11. Geological Survey of New South Wales, Sydney, 509 pages. ⓘ Rudges Mine (Baryta Reward) ? W.D. Birch., The Jamieson mercury deposit, Victoria. -Australian Journal of Mineralogy Vol.9, No.1, June 2003; McQueen, K. (2011). Mercury mining: A quick history of quicksilver in Australia. Journal of Australasian Mining History, 9, 74. Schmidt (1879); Mutschler (1913); Polz, A. (1989): Mineralien aus Vorarlberg. Vorarlberger Verl.-Anst., Dornbirn, 80 pp. Geological Survey of Canada (1912) Summary report of the Geological survey branch of the department of mines for 1911 Sessional Paper No. 26. H. How, "The Mineralogy of Nova Scotia. A Report to the Provincial Government." Charles Annand (Publisher), Halifax, Nova Scotia, 1869. Miller, Willet G. (1910): The Cobalt-Nickel Arsenides and Silver Deposits of Temiskaming (Cobalt and Adjacent Areas); Ontario Bureau of Mines, Vol. 19, pt.2, p. 24. Traill R. J. (1983), Catalogue of Canadian Minerals Revised; Geological Survey of Canada, Paper 80-18, P. 239. Ruis Fuller C/Peebles F.(1988): "Geología de los yacimientos metalíferos de Chile"; Fondecyt; Stgo de Chile. Zhiping Li, and S.G. Peters (1998): USGS Open-File Report 98-466; Peters, S.G., Huang Jiazhan, Li Zhiping, and Jing Chenggui (2007): Ore Geology Reviews 31, 170-204. Baogui Zhang (1996), In: Tu Guangzhi, Ed. : Geochemistry of Strata-bound Deposits in China. Science Press (Beijing), 396-430. Velebil, D.: Jedová hora (Dědova hora) u Neřežína. Bulletin mineralogicko-petrografického oddělení Národního muzea v Praze, 2003, roč. 11, s. 86-99. Palache, Charles, Harry Berman & Clifford Frondel (1951), The System of Mineralogy of James Dwight Dana and Edward Salisbury Dana Yale University 1837-1892, Volume II, John Wiley and Sons, Inc., New York, 7th edition, revised and enlarged, 1124 pp. : 27. Chauris, L. (2014): Minéraux de Bretagne, Les Editions du Piat, 38. Beroldingen, Fr.v. (1788) Bemerkungen zu einer Reise durch die pfälzischen und zweibrückischen Quecksilberbergwerke. J. B. Brandis (Berlin), 240 pp. In the collection of Brent Thorne. Acquired from Joy Desor. - Arndt, H.; Reis, O. M. and Schwager, A. (1920): Übersicht über die Mineralien und Gesteine der Rheinpfalz; Geognostische Jahreshefte XXXI/XXXII, 119-262.
von Beroldingen, F. C. F., & Brandis, J. D. (1788). Bemerkungen auf einer Reise durch die Pfälzischen und Zweybrückschen Quecksilber-Bergwerke: mit einer petrographischen Carte. bei Friedrich Nicolai. Arndt, H.; Reis, O. M. and Schwager, A. (1920): Übersicht über die Mineralien und Gesteine der Rheinpfalz; Geognostische Jahreshefte XXXI/XXXII, 119-262. De Stefani C. (1895) - Un nuovo giacimento di mercurio in Val Taro - Atti Soc. Tosc. Sc. Nat., Processi verbali, vol. X, 35. Geology and Mineral Resources of Japan (Geological Survey of Japan, 1960); Nokleberg, W.J., ed., (2010) Metallogenesis and tectonics of northeast Asia: U.S. Geological Survey Professional Paper 1765, 624 p.
[Lapis 11:11-24]; Pekov, I. (1998) Minerals First discovered on the territory of the former Soviet Union 369p. Ocean Pictures, Moscow; Vasil'yev, V. I., Lavrent'yev, Y. G., & Pal'chik, N. A. (1982). Poyarkovite, Hg3CIO, a new natural mercury oxychloride. International Geology Review, 24(3), 363-366. Panczner(1987):135,164,185 & 372.; Percy Babb (1909) Dulces Nombres Quicksilver Deposit, Mexico. Engineering & Mining Journal 684-686. Excalibur Mineral Co. / Chet Lemanski. Active Volcanoes of Kamchatka, vol 2, p 140, S.A. Fedotov; Migdisov, A. A., & Bychkov, A. Y. (1998). The behaviour of metals and sulphur during the formation of hydrothermal mercury-antimony-arsenic mineralization, Uzon Caldera, Kamchatka, Russia. Journal of Volcanology and Geothermal Research, 84, 153-171. Seltmann, R., Soloviev, S., Shatov, V., Pirajno, F., Naumov, E., & Cherkasov, S. (2010). Metallogeny of Siberia: tectonic, geologic and metallogenic settings of selected significant deposits*. Australian Journal of Earth Sciences, 57(6), 655-706; Bryzgalov, I. A., Shcherbachev, D. K., & Konyshev, V. O. (1999). 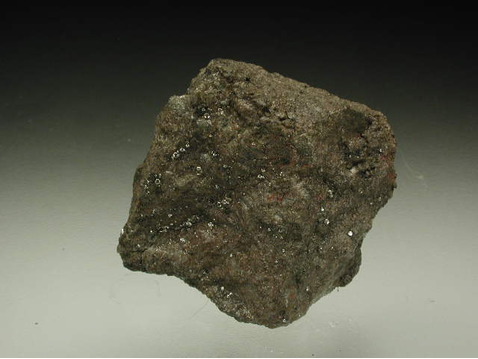 Aktashite in Ores from the Kyuchus Gold-Mercury Deposit, Northeastern Yakutia. In Doklady earth sciences (Vol. 365, pp. 272-275). Springer. Canadian Mineralogist Feb. 1999; Pekov, I. (1998) Minerals First discovered on the territory of the former Soviet Union 369p. Ocean Pictures, Moscow; Pervukhina, N. V., Vasil’ev, V. I., Borisov, S. V., Magarill, S. A., & Naumov, D. Y. (2003). The crystal structure of a polymorph of Hg2+ 3S2Br1. 0Cl0. 5I0. 5. The Canadian Mineralogist, 41(6), 1445-1453. Pekov, I. (1998) Minerals First discovered on the territory of the former Soviet Union 369p. Ocean Pictures, Moscow; Vasil'yev, V. I., Lavrent'yev, Y. G., & Pal'chik, N. A. (1983). Kelyanite, Hg36Sb3 (Cl, Br) 9028-a new mineral. International Geology Review, 25(7), 864-868. Karl Cäsar von Leonhard (1820): Taschenbuch für die gesammte Mineralogie, Band 14, p. 392. Calvo, Miguel. (2003) Minerales y Minas de España. Vol. II. Sulfuros y sulfosales. Museo de Ciencias Naturales de Alava. Vitoria. 705 págs. Salvador Maturana, Angel Hernández (1995): Almadén del Azogue. Bocamina, 1, 38-64. Simmons, S. F., White, N. C., & John, D. A. (2005). Geological characteristics of epithermal precious and base metal deposits. Economic Geology 100th anniversary volume, 29, 485-522.; Henley, R. W., & Berger, B. R. (2012). Pyrite–sulfosalt reactions and semimetal fractionation in the Chinkuashih, Taiwan, copper–gold deposit: a 1 Ma paleo‐fumarole. Geofluids, 12(3), 245-260. Chemical Geology 154 1999. 155–167; L. P. Tan, C. H. Chen and B. S. Yu (1993) Native Gold of Taiwan. Special Publication of the Central Geological Survey No. 7, pp. 79-99. Anthony, J.W., et al (1995), Mineralogy of Arizona, 3rd.ed. : 236, 293; Lawsen, C. (1936), The occurrence of minute quantities of mercury in the Chinle shales at Lee's Ferry, AZ, Econ.Geol. : 31: 610-617; Lawson, A.C. (1913), The gold in the Shinarump (Chinle) at Paria, Econ.Geol. : 8: 434-448. Galbraith, F.W. (1947), Minerals of AZ, AZ Bur. of Mines Bull. 153: 10. Anthony, J.W., et al (1995), Mineralogy of Arizona, 3rd.ed. : 293; Faick, J.N. (1958), Geology of the Ord mine, Mazatzal Mountains Quicksilver district, AZ, USGS Bull. 1042-R: 685. Anthony, J.W., et al (1995), Mineralogy of Arizona, 3rd.ed. : 293; Beckman & Kerns (1965). Ransome, F.L. (1916), Quicksilver Deposits of the Mazatzal Range, Arizona, in Contributions to Economic Geology by F.L. Ransome & H.S. Gale, USGS Bull. 620: 119. Anthony, J.W., et al (1995), Mineralogy of Arizona, 3rd.ed. : 293; Lausen, C. (1926), Tourmaline-bearing cinnabar veins of the Mazatzal Mountains, AZ, Econ.Geol. :: 21: 782-791; Galbraith, F.W. (1947), Minerals of AZ, AZ Bur. Mines Bull. 153: 10. Galbraith, F.W. (1947), AZ Bur. of Mines Bull. 153, Minerals of AZ: 10. Keith, Stanton B. (1974), AZ Bur. of Geol. & Min. Technology, Geol. Survey Br. Bull. 189, Index of Mining Properties in Pima County, AZ: 117 (Table 4); Arizona Bureau of Mines file data. Anthony, J.W., et al (1995), Mineralogy of Arizona, 3rd.ed. : 293; Beckman, R.T. & W.H. Kerns (1965), Mercury in AZ, in Mercury potential of the US, US Bur. of Mines Inf. Circ. 8252. Anthony, J.W., et al (1995), Mineralogy of Arizona, 3rd.ed. : 293; Engineering Mining Jour. (1897), General mining news: Vol. 64, No.6. Anthony, J.W., et al (1995), Mineralogy of Arizona, 3rd.ed. : 293; Wilson, E.D. (1961); Galbraith, F.W. (1947), Minerals of AZ, AZ Bur. Mines Bull. 153: 10. Mining and Scientific Press (1874), Quicksilver in Del Norte County: Mining and Scientific Press: 29: 104; Murdoch, Joseph & Robert W. Webb (1966), Minerals of California, Centennial Volume (1866-1966): California Division Mines & Geology Bulletin 189: 259. Maxson, John Haviland (1933), Economic geology of portions of Del Norte and Siskiyou Counties, northwesternmost California: California Division Mines Report 29: 156-158; O’Brien, J.C. (1952b), Mines and minerals of Del Norte County, California: California Journal of Mines and Geology: 48(4): 281, 309; Cater, F.W. & F.G. Wells (1953), Geology and mineral resources of the Gasquet quadrangle, California-Oregon: USGS Bulletin 955-C: 79-133. (Del Norte Co): 125-129; Holmes, Jr., G.W. (1965), Mercury in California: in: U.S. Bureau of Mines Information Circular 8252: 169-170, 198; Pemberton, H. Earl (1983), Minerals of California; Van Nostrand Reinholt Press: 114. O’Brien, J.C. (1943), Current notes on activity in the strategic minerals, Redding field district: California Division Mines Report 39: 77-84; Murdoch, Joseph & Robert W. Webb (1966), Minerals of California, Centennial Volume (1866-1966): California Division Mines & Geology Bulletin 189: 259. O’Brien, J.C. (1952b), Mines and minerals of Del Norte County, California: California Journal of Mines and Geology: 48(4): 281-282; Pemberton, H. Earl (1983), Minerals of California; Van Nostrand Reinholt Press: 114. Bradley, W.W. (1916b), Fresno and Kings Counties: California Mining Bureau. Report 14: 529; Bailey, Edgar H. (1942), Quicksilver deposits of the Parkfield district, California: USGS Bulletin 936-F: 143-169; Southern Pacific Company (1964b) Minerals for Industry, Vol III - Southern California, 242 pp. : 14-15; Pemberton, H. Earl (1983), Minerals of California; Van Nostrand Reinholt Press: 115. Friedrich, James J. (1888), Stalactitic melanterite and other minerals from California: New York Academy of Science Transactions: 8: 22; Murdoch, Joseph & Robert W. Webb (1966), Minerals of California, Centennial Volume (1866-1966): California Division Mines & Geology Bulletin 189: 259. Aubury, Lewis E. (1903), The quicksilver resources of California: California Mining Bureau Bulletin 27: 51; Murdoch, Joseph & Robert W. Webb (1966), Minerals of California, Centennial Volume (1866-1966): California Division Mines & Geology Bulletin 189: 260. Murdoch, Joseph & Robert W. Webb (1966), Minerals of California, Centennial Volume (1866-1966): California Division Mines & Geology Bulletin 189: 259. Crawford, James John (1894), Twelfth report of the State Mineralogist: California Mining Bureau. Report 12: 360; Murdoch, Joseph & Robert W. Webb (1966), Minerals of California, Centennial Volume (1866-1966): California Division Mines & Geology Bulletin 189: 260; Pemberton, H. Earl (1983), Minerals of California; Van Nostrand Reinholt Press: 116. Crawford, James John (1894), Twelfth report of the State Mineralogist: California Mining Bureau. Report 12: 360; Ransome, Alfred Leslie & J.L. Kellogg (1939), Quicksilver resources of California: California Division Mines Report 35: 392; Murdoch, Joseph & Robert W. Webb (1966), Minerals of California, Centennial Volume (1866-1966): California Division Mines & Geology Bulletin 189: 260, 262; Rocks & Minerals: 19: 40-41. Pemberton, H. Earl (1983), Minerals of California; Van Nostrand Reinholt Press: 116. Schmitz (1852), Goldamalgan in Caifornien, letter to V. Gerolt: Deut. Geol. Ges., Zeitschr. 4: 712-714; Murdoch, Joseph & Robert W. Webb (1966), Minerals of California, Centennial Volume (1866-1966): California Division Mines & Geology Bulletin 189: 260. USGS MRDS database (2005), loc. file ID #10031360; Irwin's notes PSFC. Watts, Wm. L. (1893), Alameda, Colusa, Del Norte, Fresno, Glenn, Humboldt, Marin, Mendocino, Merced, Placer, Sacramento, Santa Clara, San Joaquin, Sonoma, Stanislaus, Sutter, Kern, Lake, Contra Costa, Tehama, Tulare Counties California Mining Bureau. Report 11: 256; Murdoch, Joseph & Robert W. Webb (1966), Minerals of California, Centennial Volume (1866-1966): California Division Mines & Geology Bulletin 189: 260. Murdoch, Joseph & Robert W. Webb (1966), Minerals of California, Centennial Volume (1866-1966): California Division Mines & Geology Bulletin 189: 260. Bradley, W.W. (1918), Quicksilver resources of California, with a section on metallurgy and ore dressing: California Mining Bureau. Bulletin 78, 389 pp. : 81; Murdoch, Joseph & Robert W. Webb (1966), Minerals of California, Centennial Volume (1866-1966): California Division Mines & Geology Bulletin 189: 260. Bradley, W.W. (1918), Quicksilver resources of California, with a section on metallurgy and ore dressing: California Mining Bureau. Bulletin 78, 389 pp. : 80-81. Bradley, W.W. (1918), Quicksilver resources of California, with a section on metallurgy and ore dressing: California Mining Bureau. Bulletin 78, 389 pp. ; Ransome, Alfred Leslie & J.L. Kellogg (1939), Quicksilver resources of California: California Division Mines Report 35: 353-486; Murdoch, Joseph & Robert W. Webb (1966), Minerals of California, Centennial Volume (1866-1966): California Division Mines & Geology Bulletin 189: 260; Pemberton, H. Earl (1983), Minerals of California: 118 & 120. Fairbanks, Harold W. (1893b), Geology of San Diego County; also portion of Orange and San Bernardino Counties: California Mining Bureau. Report 11: 118; Murdoch, Joseph & Robert W. Webb (1966), Minerals of California, Centennial Volume (1866-1966): California Division Mines & Geology Bulletin 189: 260. Bradley, W.W. (1918), Quicksilver resources of California, with a section on metallurgy and ore dressing: California Mining Bureau. Bulletin 78, 389 pp. : 97; Murdoch, Joseph & Robert W. Webb (1966), Minerals of California, Centennial Volume (1866-1966): California Division Mines & Geology Bulletin 189: 260. Canadian Mineralogist: 34: 61-72.; Mineralogical Record (1993): 24: 471-475. Murdoch, Joseph & Robert W. Webb (1966), Minerals of California, Centennial Volume (1866-1966): California Division Mines & Geology Bulletin 189: 273. Bradley, W.W. (1918), Quicksilver resources of California, with a section on metallurgy and ore dressing: California Mining Bureau. Bulletin 78, 389 pp. : 124, 191. Rogers, Austin Flint (1911a), Eglestonite from San Mateo County, California: American Journal of Science, 4th. Series: 32: 48-50; Bradley, W.W. (1918), Quicksilver resources of California, with a section on metallurgy and ore dressing: California Mining Bureau. Bulletin 78: 149; Murdoch, Joseph & Robert W. Webb (1966), Minerals of California, Centennial Volume (1866-1966): California Division Mines & Geology Bulletin 189: 173-174. Rogers, Austin Flint (1911a), Eglestonite from San Mateo County, California: American Journal of Science, 4th. Series: 32: 48-50; Murdoch, Joseph & Robert W. Webb (1966), Minerals of California, Centennial Volume (1866-1966): California Division Mines & Geology Bulletin 189: 119, 260. Rogers, Austin Flint (1911a), Eglestonite from San Mateo County, California: American Journal of Science, 4th. Series: 32: 48-50; Woodhouse, C.D. (1934), A new occurrence of montroydite in California: American Mineralogist: 19: 603-604; Pemberton, H. Earl (1983), Minerals of California; Van Nostrand Reinholt Press: 197. Mining and Scientific Press (1868), Quicksilver in San Mateo County (from San Mateo Gazette): Mining and Scientific Press: 16: 357; Woodhouse, C.D. (1934), A new occurrence of montroydite in California: American Mineralogist: 19: 603; Murdoch, Joseph & Robert W. Webb (1966), Minerals of California, Centennial Volume (1866-1966): California Division Mines & Geology Bulletin 189: 260. Woodhouse, C.D. (1934), A new occurrence of montroydite in California: American Mineralogist: 19: 603-604; Murdoch, Joseph & Robert W. Webb (1966), Minerals of California, Centennial Volume (1866-1966): California Division Mines & Geology Bulletin 189: 119, 273. Crawford, James John (1894), Twelfth report of the State Mineralogist: California Mining Bureau. Report 12: 358; Murdoch, Joseph & Robert W. Webb (1966), Minerals of California, Centennial Volume (1866-1966): California Division Mines & Geology Bulletin 189: 260. Bradley, W.W. (1918), Quicksilver resources of California, with a section on metallurgy and ore dressing: California Mining Bureau. Bulletin 78, 389 pp. : 191; Huguenin, Emile & W.O. Castello (1921), Alameda, Contra Costa, San Francisco, San Mateo, Santa Clara, Santa Cruz Counties: California Mining Bureau. Report 17: 222; Bailey, Edgar H. & Donald L. Everhart (1964), Geology and quicksilver deposits of the New Almaden district, Santa Clara County, California: USGS PP 360: 96; Murdoch, Joseph & Robert W. Webb (1966), Minerals of California, Centennial Volume (1866-1966): California Division Mines & Geology Bulletin 189: 260. Ransome, Alfred Leslie & J.L. Kellogg (1939), Quicksilver resources of California: California Journal of Mines and Geology: 35(4): 459; Murdoch, Joseph & Robert W. Webb (1966), Minerals of California, Centennial Volume (1866-1966): California Division Mines & Geology Bulletin 189: 260; Pemberton, H. Earl (1983), Minerals of California; Van Nostrand Reinholt Press: 123. Pemberton, H. Earl (1983), Minerals of California; Van Nostrand Reinholt Press: 50. Aubury, Lewis E. (1902), The copper resources of California: California Mining Bureau Bulletin 23: 141; Aubury, Lewis E. (1908), The copper resources of California: California Mining Bureau. Bulletin 50: 166; Murdoch, Joseph & Robert W. Webb (1966), Minerals of California, Centennial Volume (1866-1966): California Division Mines & Geology Bulletin 189: 261. Becker, George F. (1888b), Geology of the quicksilver deposits of the Pacific slope: USGS Monograph 13, atlas: 377; Ross, Clyde Polhemus (1940b), Quicksilver deposits of the Mayacmas and Sulphur bank districts, California: USGS Bulletin 922-L: 330; Bailey, Edgar H. (1946), Quicksilver deposits of the western Mayacmas district, Sonoma County, California: California Division Mines Report 42: 199-230; Pemberton, H. Earl (1983), Minerals of California; Van Nostrand Reinholt Press: 124. Bradley, W.W. (1918), Quicksilver resources of California, with a section on metallurgy and ore dressing: California Mining Bureau. Bulletin 78, 389 pp. : 186; Bradley, W.W. (1938), Thirty-fourth report of the State Mineralogist: California Division Mines Report 34: 608; Murdoch, Joseph & Robert W. Webb (1966), Minerals of California, Centennial Volume (1866-1966): California Division Mines & Geology Bulletin 189: 261, 274; Pemberton, H. Earl (1983), Minerals of California; Van Nostrand Reinholt Press: 181. Becker, George F. (1888b), Geology of the quicksilver deposits of the Pacific slope: USGS Monograph 13, atlas: 377; Ross, Clyde Polhemus (1940b), Quicksilver deposits of the Mayacmas and Sulphur bank districts, California: USGS Bulletin 922-L: 330; Bailey, Edgar H. (1946), Quicksilver deposits of the western Mayacmas district, Sonoma County, California: California Journal of Mines and Geology, California Division Mines (Report 42): 42: 199-230. Becker, George F. (1888b), Geology of the quicksilver deposits of the Pacific slope: USGS Monograph 13, atlas: 377; Ross, C.P. (1940b) Quicksilver deposits of the Mayacmas and Sulphur Bank districts, California. USGS Bulletin 922-L: 330; Bailey, Edgar H. (1946), Quicksilver deposits of the western Mayacmas district, Sonoma County, California: California Division Mines Report 42: 199-230; Pemberton, H. Earl (1983), Minerals of California; Van Nostrand Reinholt Press: 124; Bradley, W.W. (1918), Quicksilver resources of California, with a section on metallurgy and ore dressing: California Mining Bureau. Bulletin 78, 389 pp. : 191; Murdoch, Joseph & Robert W. Webb (1966), Minerals of California, Centennial Volume (1866-1966): California Division Mines & Geology Bulletin 189: 261. Aubury, Lewis E. (1903), The quicksilver resources of California: California Mining Bureau Bulletin 27: 115; Bradley, W.W. (1918), Quicksilver resources of California, with a section on metallurgy and ore dressing: California Mining Bureau. Bulletin 78, 389 pp. : 191, 193, 195; Bailey, Edgar H. (1946), Quicksilver deposits of the western Mayacmas district, Sonoma County, California: California Journal of Mines & Geology, California Division Mines (Report 42): 42: 216; Mineralogical Record (1989) 20: 129-142. Aubury, Lewis E. (1903), The quicksilver resources of California: California Mining Bureau Bulletin 27: 102; Bradley, W.W. (1918), Quicksilver resources of California, with a section on metallurgy and ore dressing: California Mining Bureau. Bulletin 78, 389 pp. : 185; Murdoch, Joseph & Robert W. Webb (1966), Minerals of California, Centennial Volume (1866-1966): California Division Mines & Geology Bulletin 189: 150, 261; Pemberton, H. Earl (1983), Minerals of California; Van Nostrand Reinholt Press: 124. Eggleston, Thomas (1874-75), Notes on the treatment of mercury in north California: A.I.M.E. Transactions: 3: 273-274; Becker, George F. (1888b), Geology of the quicksilver deposits of the Pacific slope: USGS Monograph 13, atlas: 377; Bradley, W.W. (1918), Quicksilver resources of California, with a section on metallurgy and ore dressing: California Mining Bureau. Bulletin 78, 389 pp. : 192; Murdoch, Joseph & Robert W. Webb (1966), Minerals of California, Centennial Volume (1866-1966): California Division Mines & Geology Bulletin 189: 260. Miller, William P. (1890), Trinity County: California Mining Bureau. Report 10: 716; Murdoch, Joseph & Robert W. Webb (1966), Minerals of California, Centennial Volume (1866-1966): California Division Mines & Geology Bulletin 189: 261; O’Brien, J.C. (1965) Mines and mineral resources of Trinity County, California. Caifornia Division of Mines and Geology County Report 4: 125 pp. : 48-49, 120-121; Pemberton, H. Earl (1983), Minerals of California; Van Nostrand Reinholt Press: 124. Mining and Scientific Press (1893), The Integral quicksilver mine: Mining and Scientific Press: 67: 323; Murdoch, Joseph & Robert W. Webb (1966), Minerals of California, Centennial Volume (1866-1966): California Division Mines & Geology Bulletin 189: 261. Wilson, J.S. (1854), On the gold regions of California: Geological Society of London Quarterly Journal: 10: 315; Murdoch, Joseph & Robert W. Webb (1966), Minerals of California, Centennial Volume (1866-1966): California Division Mines & Geology Bulletin 189: 204. Palache, C., Berman, H., & Frondel, C. (1951), The System of Mineralogy of James Dwight Dana and Edward Salisbury Dana, Yale University 1837-1892, Volume II: 90.
ⓘ Wheeler Ranch prospect ? Oregon Metal Mines Handbook, 1943, Oregon Department of Geology and Mineral Industries: Bulletin No. 14-C, Vol. 2, Section 2 - Jackson Co., page 179. Oregon Metal Mines Handbook, 1943, Oregon Department of Geology and Mineral Industries: Bulletin No. 14-C, Vol. 2, Section 2 - Jackson Co., page 94. Palache, C., Berman, H., & Frondel, C. (1951), The System of Mineralogy of James Dwight Dana and Edward Salisbury Dana, Yale University 1837-1892, Volume II: 52.